I've figured out by now that I simply have nothing useful to say about screwball comedies except that I don't like them. I have watched more than half of the supposed very best of the genre and I don't find any of them particularly funny. The piled-up contrivances, the glib dialogue, all the celebrity mugging for the camera – they aren't mistakes, but carefully calculated creative choices that just irritate the heck out of me. Virtually everyone else in the world thinks they're the greatest. Anything. Ever. That's certainly true of Preston Sturges's universally-except-by-me-beloved-nay-worshipped “The Palm Beach Story” (1942). A quick scan through reviews and comments reveals reactions such as “I watch this whenever I feel sad and then I'm not sad anymore” and “Thank God it's only 88 minutes because I would have to check into a hospital if I laughed so hard for two full hours.” I paraphrase, but those aren't even the most enthusiastic reactions. Sturges, one of the earlier true writer-directors in Hollywood, was known for his urbane, rapid-fire dialogue and his deftly-paced comic storylines. “Palm Beach” certainly doesn't waste any time, compressing an entire film's worth of story into just the wordless opening credit sequence, a helter-skelter spasm that appears to involve a wedding gone wrong and then possibly right and then wrong again. When the main story picks up the married couple is definitely not living happily ever after. Though they live in an uber-swanky New York apartment, they are about to be evicted due to a lack of funds. Tom (Joel McRae) has an idea for a new airport that's so visionary nobody wants to finance it. Gerry (Claudette Colbert, perhaps Hollywood's biggest female star at the time), who styles herself the more “pragmatic” of the two, concocts a plan that involves breaking up with Tom, hopping a train to Palm Beach to get a divorce, and then snagging herself a new millionaire husband along the way so she can funnel some money back to ex-husband-to-be Tom so he could build his dream. 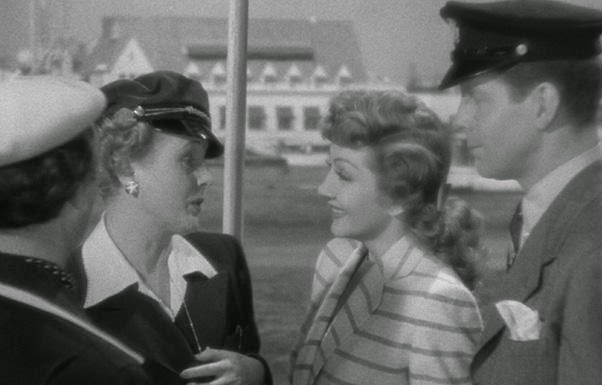 Sturges obviously wasn't concerned with plausibility, counting on his story-telling skills and the charm of his celebrity stars to power the film through one absurd situation after another. Gerry attracts the attention first of a group of rich drunks who pay her way onto a train and later a lonely multi-millionaire (Rudy Vallee) who is happy to buy her affection and then to buy off Tom. People keep taking pratfalls, identities are mistaken, and words are sprayed like Uzi-fire in scene after scene. The film's fans find Colbert's antics charming. I find her plan asinine to the point of distraction and her manipulation of the millionaire incredibly cruel. An ending that takes the absurdity to a whole different level reminds us we're not supposed to take any of it seriously for even a second, but that's also part of the problem for me too. I didn't laugh once. Still, as with the recent Criterion screwball release “It Happened One Night,” I can respect the film's considerable craft even if I can't find a lot to enjoy about a comedy I simply don't find funny. 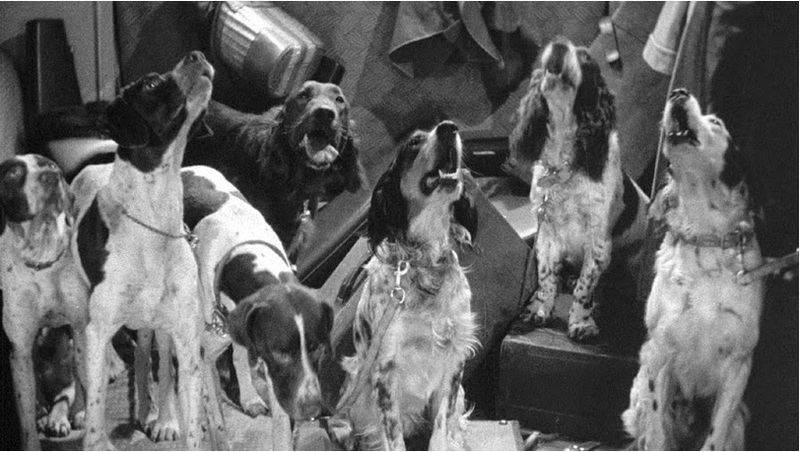 If you don't mind spending twenty-plus minutes watching drunks bellow and stumble around along with lots of howling dogs, the train sequence is a marvel of economic editing and composition, turning a confined space into an expansive stage. Robert Dudley also delivers a wonderful supporting performance as the Weenie King, a hard-of-hearing tycoon with a heart of gold. I'm sure by now you agree with my thesis statement. I have nothing useful to say about screwball comedies. Well, nobody's perfect. The film is presented in its original 1.37:1 aspect ratio. Criterion's only explanation about the new 1080p transfer is that it's “from a 35 mm nitrate fine-grain and a safety duplicate negative.” I don't know how much restoration was done but this 70+ year-old image is remarkably sharp and damage-free save for a few minor specks here and there. The black-and-white image is sometimes quite lustrous and the rich grain-structure sure does a fine job of replicating a filmic quality. The linear PCM mono track is crisp but somewhat flat as is to expected with most mono tracks. The faintest background hiss is audible in quieter moments but nothing significant. The film is wall-to-wall dialogue and it's all clearly rendered. The very heavy-handed score sounds a bit thin but still solid. Optional English subtitles support the English audio. Film historian James Harvey (2014, 17 min.) briefly discusses Sturges's rise to prominence at Paramount. The concept of the writer-director was virtually unheard of at the time, but Sturges's early success and the relative open-mindedness of Paramount helped him get more control over his projects with “Palm Beach” being released at the height of his prowess. Harvey also talks about Sturges's wealthy upbringing and his desire to be seen both as a sophisticate and as a normal Joe. Perhaps the neatest extra is the short film “Safeguarding Military Information” (1941, 11 min. ), a training film directed by Sturges for the Signal Corps and distributed by the War Activities Committee. It's pretty standard issue but should be of interest to Sturges fans. Listen, you'll love it. I know you will because you're not me. 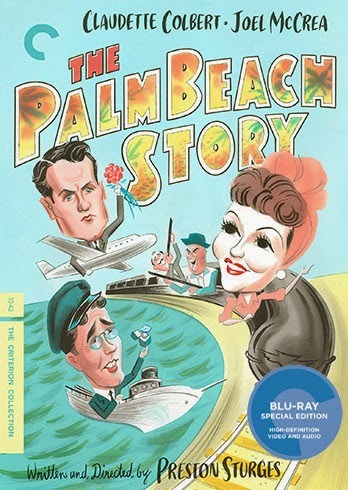 Which eliminates the entire population that doesn't love “The Palm Beach Story.” The extras are pretty sparse but the high-def transfer is a strong one so enjoy.